We had some good friends over this weekend for a grown-ups only dinner. With no kids, I went all out with festive decorations, including lit candles. 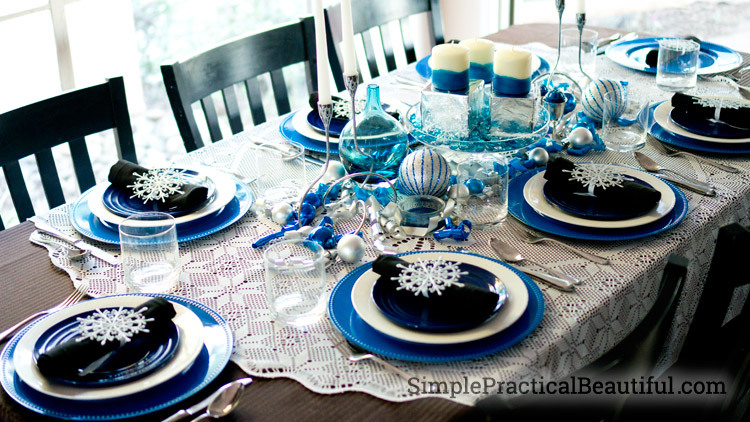 I’m really excited to share my fun tablescape with you, so there are lots of pictures. 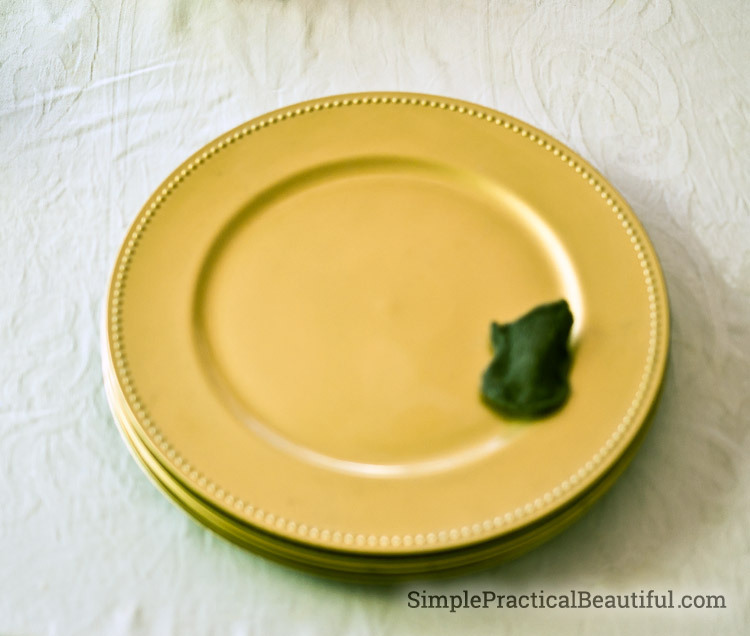 Deb from Seeking Lavender Lane wrote a great post about setting a Thanksgiving Table for a Hostess on a Budget. 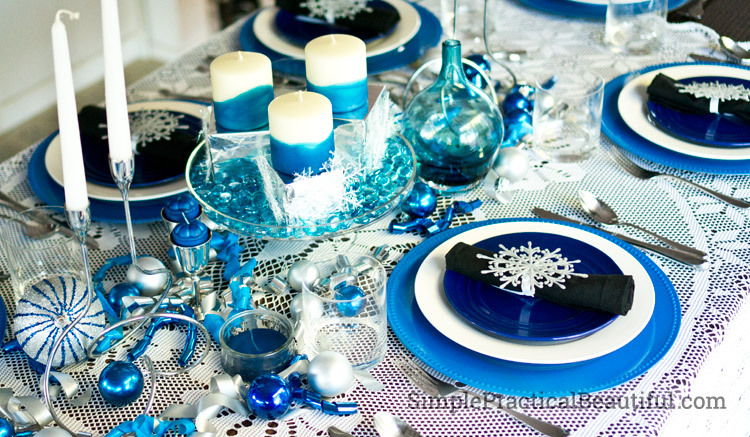 She gave a great table decorating tip to start with deciding your color palette. 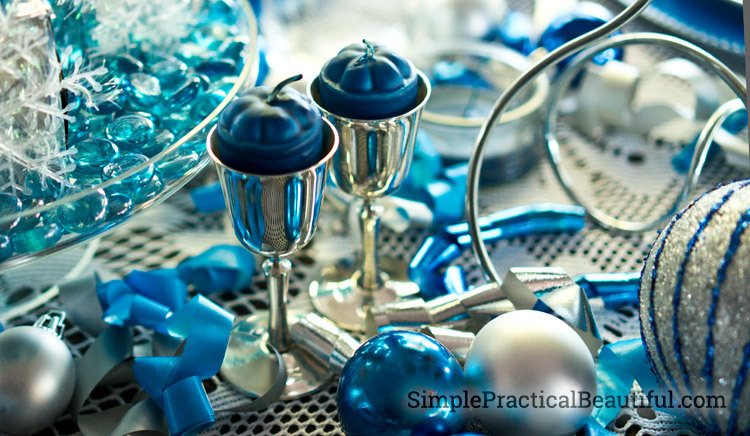 I have some cool silver candlesticks, and I’m trying to bring more blue into my decor. So my color palette was silver and blue with black and white accents. Several days before the dinner, I bought some gold chargers from the dollar store with the idea of painting them blue. First, I scrubbed them with steel wool, so the paint would stick. Then I spray painted them with blue Rust-Oleum Gloss Protective Enamel (it was the cheapest blue paint I could find). I did this a few days ahead of time so that there wouldn’t be any paint smell left to ruin the dinner. No food should actually go on a charger, so I didn’t worry about them being food safe. 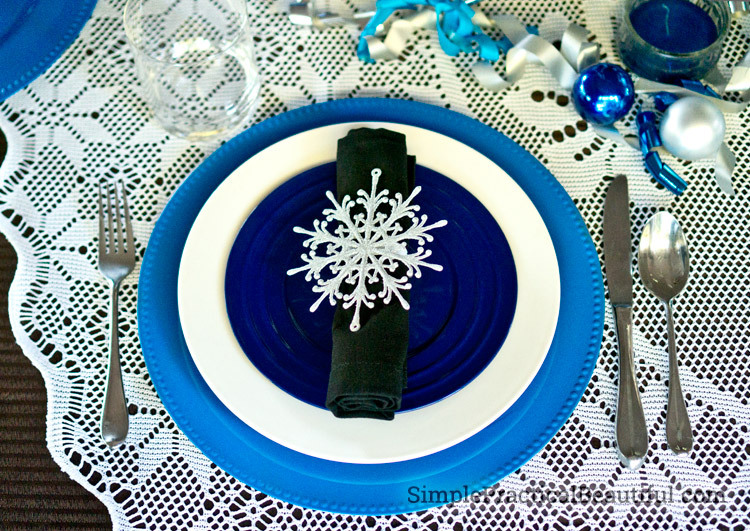 I also painted some dollar store snow flakes metallic silver to use as napkin rings. I glued a white ribbon on the back and tied those around my black napkins. Polishing silver is something that needs to be done ahead of time too, and it’s something I really enjoy. I only had two small candle holders that were silver, but I love seeing the silver turn from nasty tarnish to beautiful, soft silver. 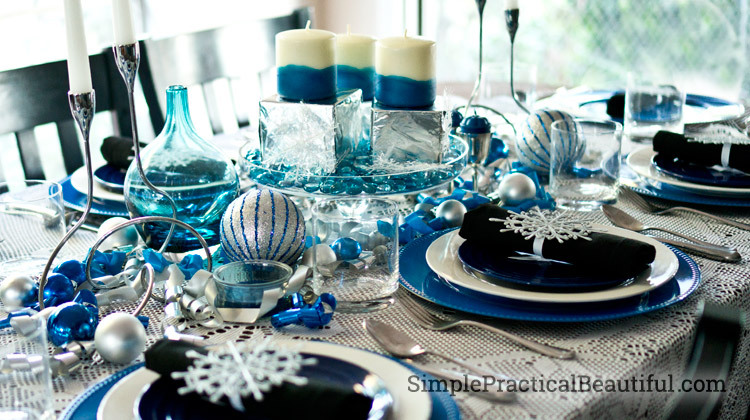 The centerpiece is the best place to start setting the table. It is the focal point and sets the tone for the rest of the table. 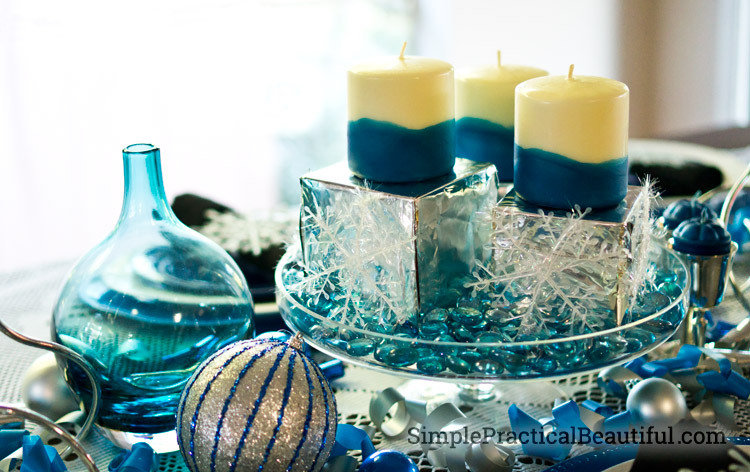 My centerpiece is a clear cake stand with candles. I used some of my toddler’s stacking blocks, covered in aluminum foil, to give the candles a varying height. I also added dollar store snowflakes to the blocks because the aluminum foil by itself was looking a little cheap. I put some blue glass stones from the dollar store (are you noticing a trend here?) on the bottom of the cake stand to add my blue. 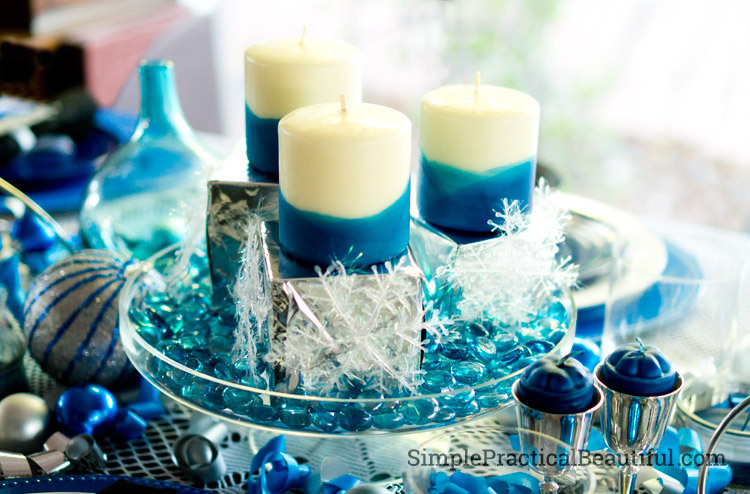 The candles were just plain, white candles, but since they were the focus of the centerpiece, they needed something else. 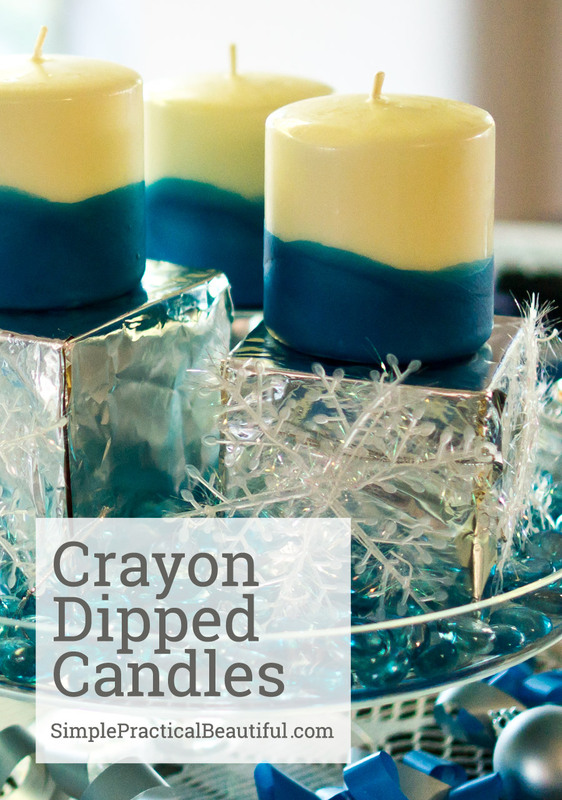 Just an hour or so before our guests came, I had an idea: dipped candles. I asked my kids for a few old blue crayons. I put those in a small metal bowl, and set the bowl inside a pot with water. The water needs to stay out of the bowl or it would ruin the wax, but the water keeps the wax from getting too hot on the stove. This also works for melting chocolate. I also added a couple of small, discolored candles just to have more wax. When the wax had all melted, I held the metal bowl with an oven mitt and dipped each candle in the wax, swirling it around. I wish I had a picture to show you, but it was actually pretty easy. My only advice would be to dip quickly because you can always add more colored wax to make it darker. You can’t take wax off. Dipping the candles was fun, and I am really happy with how they turned out. They’re going to be part of my regular decor now. Since my centerpiece was not very tall, I added height on the side with two candlesticks. These candlestick don’t take up much visual space which makes them perfect for a table because you can still see the person across from you and carry on a conversation. 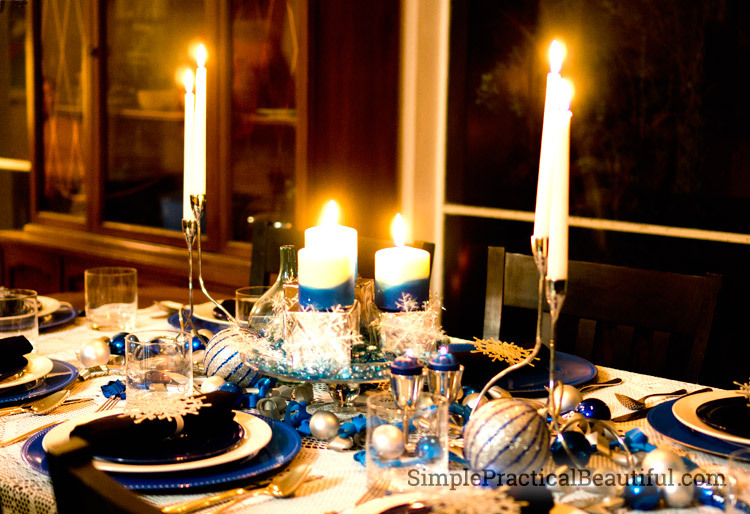 I added a few interesting items around the centerpiece and candles, mostly from the dollar store: a blue vase, a couple large ball ornaments, several small ball ornaments, and small blue candles in my silver candle holders. 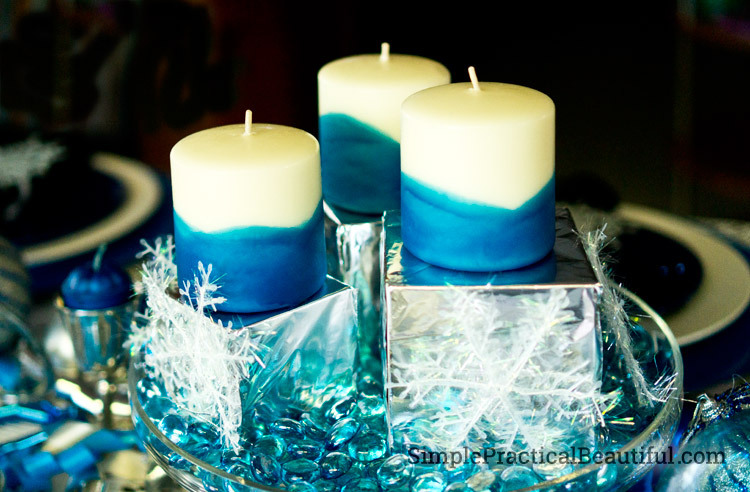 When I dipped the candles for the centerpiece, I had a lot of blue wax left over and a couple of wicks from the little candles a melted. I grabbed a couple of clear glass dishes, stuck the wicks in the middle, and poured in the excess was. 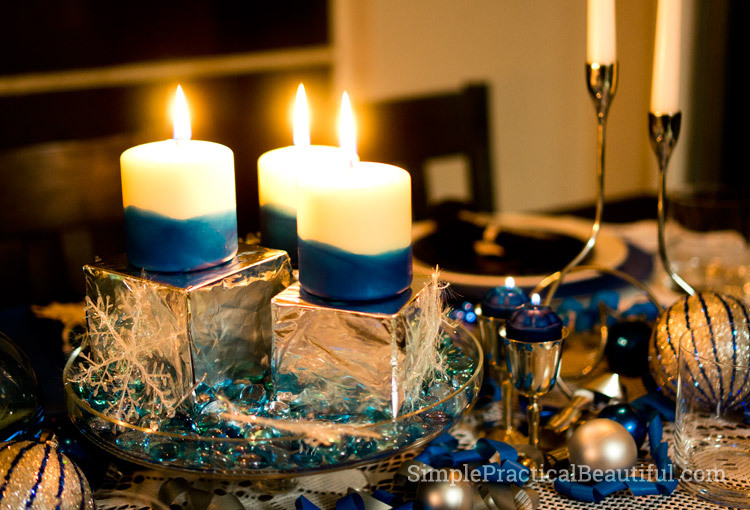 And just like that, I had two blue candles to add to my table. With all of the objects on the table, I needed some way to connect everything together so that it didn’t look like a bunch of stuff scattered around the table. 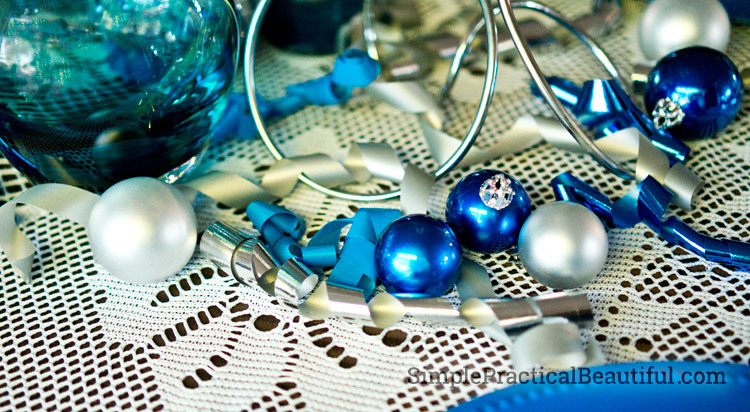 I took apart some silver and blue ribbons bow and spread the ribbon around the centerpiece and candles. The silver and blue pulled everything together. 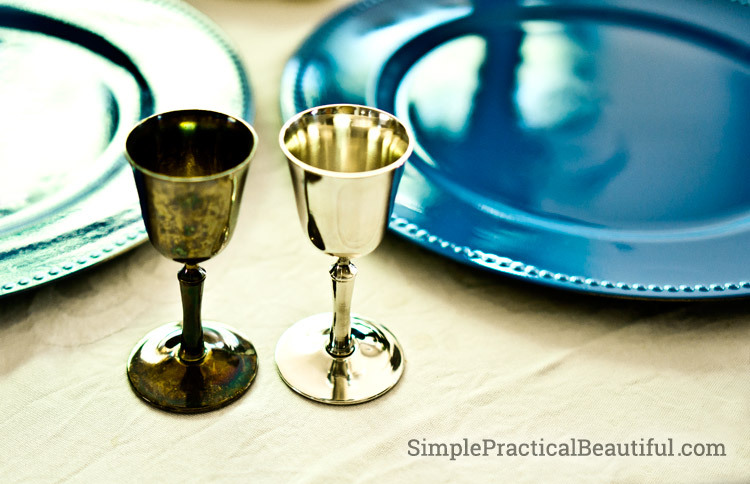 I love the look of stacked place settings. They give layers and interest to each person’s place. 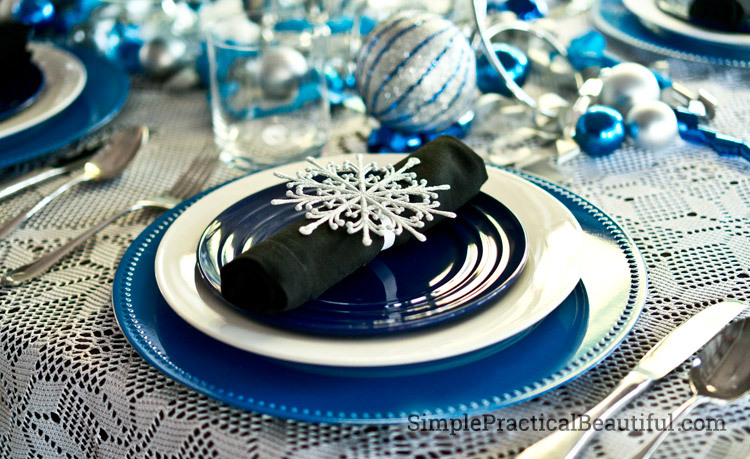 With the blue charger on the bottom, the white dinner plate framed the smaller blue salad plate, and the silver napkin ring added sparkle on the top. Just before we sat down to dinner, we lit the candles and turned down the lights. I wasn’t quite sure before then how it would look. With 11 candles total, it was pretty impressive. Having a dinner without kids was a lot of fun, for many reasons. It was a good dinner with some great friends. 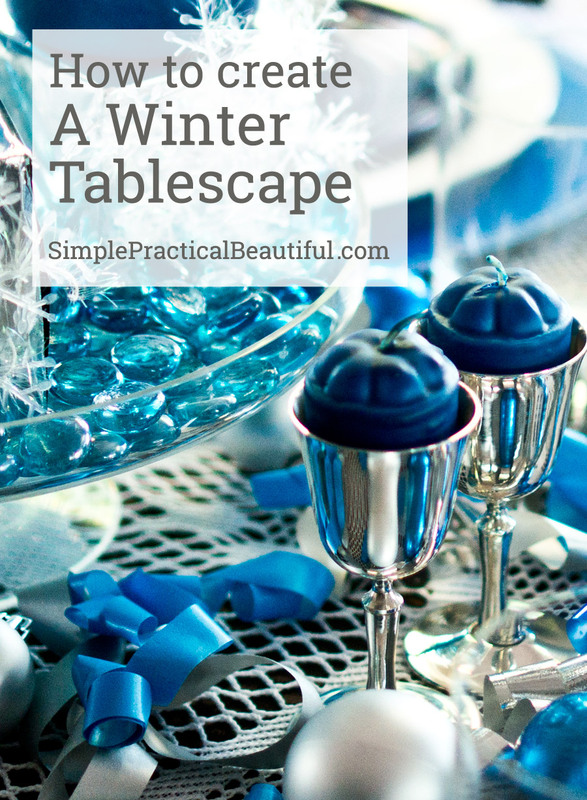 I am in love with this winter tablescape! It is gorgeous! Every little detail is perfect, and it doesn’t seem too expensive or difficult to make, either. So creative! Thank you so much, Celeste. It was a lot of fun to make, and everything I had to buy was from the dollar store. Now that the dinner is over, most of the decorations are brightening up my living room. Thanks so much! 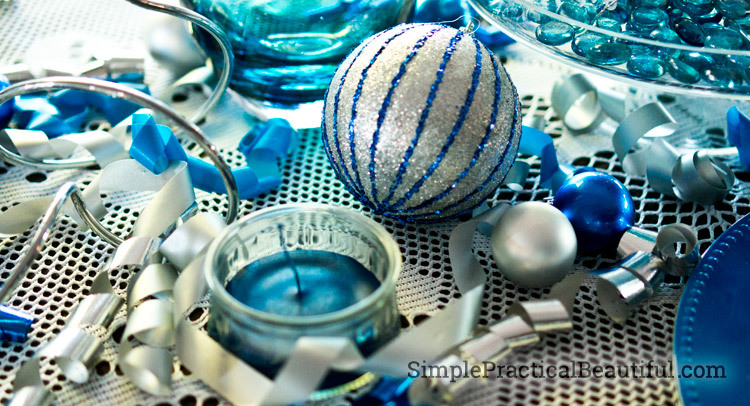 I figured with blue and silver, I can use the decorations throughout the winter. I love the blue and white! So prety..and those candles are awesome! Thank you so much for sharing at The Creative Circle Link Party. Thanks! The Creative Circle is an awesome party because it’s almost all home decor stuff, which I love. Rebecca this is absolutely stunning. There is something about the blue that says winter in all its glory. Beautiful tablescape. And ther is texture and height and eveything. Just gorgeo us. Good idea you had dinner without the kids, sometimes youjust want to have some adult fun time. Thank you so much Mary. It was so fun to put together, mostly because I rarely do table decorations. With lots of kids around, it just doesn’t feel worth it. It was good to have an adult night. Yes, but I think that it should have more of a fairy garden theme, since that’s the theme of your birthday. We will have to look for decorations at the dollar store, maybe in the gardening section.